Hey Homeschoolers! Join us outdoors this spring for a fun time exploring God's great creation and developing your skills as an outdoorsman / outdoorswoman. Activities will include survival skills, like fire building and navigating a worse case scenario, nature education, paintball and, of course, fishing, archery and maybe even riflery. Class will meet from 1 - 3 PM April 15 - May 6 (Mondays) rain or shine (hopefully no snow). This is for students in grades 1-12 (certain activities may be split into age groups so as to challenge the older students). Parents are encouraged to participate as much as they would like. The cost of this program is $55 per participant. This 4 week special focus archery program allows children with Autism to participate in a sport that fosters confidence, social interaction, problem solving and team work. Our desire is that the skill sets learned in this sport can have positive results on the children and their families. While we want to see this program broaden for a greater range of students, for this particular program, participation will be limited to 8 students with higher functioning autism and Asperger's Syndrome. For students ages 8-18 years. We will meet on Monday nights starting April 15th from 6 - 7 PM. Join us this spring for our first ever Rifle Club! Every week in Rifle Club students will be coached in marksmanship skills which will be implemented in fun shooting games and friendly competitions. Safety, respect, confidence and concentration are just a few of the qualities we will be instilling throughout this program. Rifle Club will be a 4 week long program and will be held on Saturdays beginning on May 11th from 10 - Noon. Any level of experience is welcome! Rifles will be provided. However, if you have your own .22 caliber rifle, you will be permitted to use it most weeks. Program is for shooters from 10 - 16 years old. This 4 week program is a test-run to see about a long term Rifle Club and/or Competitive Rifle Team. 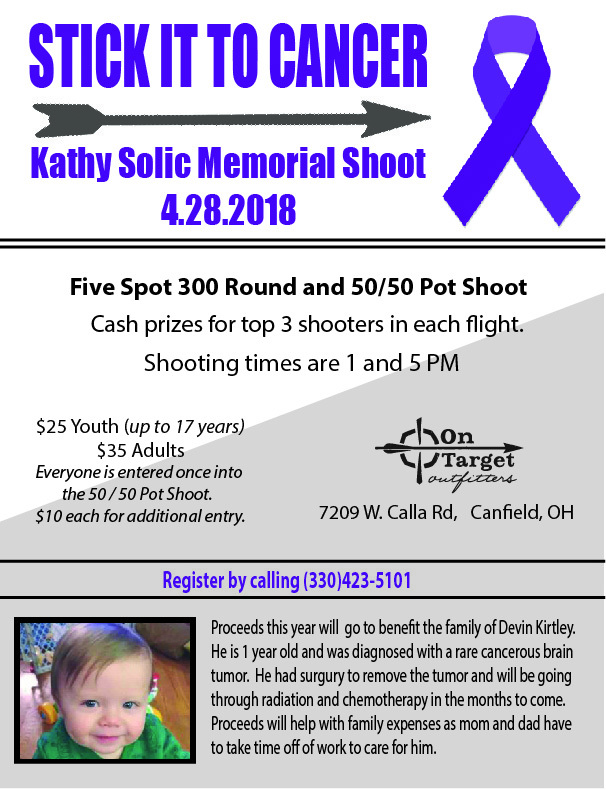 Our second annual Stick It to Cancer - Kathy Solic Memorial Shoot will be here before you know it. This year proceeds will go to benefit the family of Hannah Tringhese. Hannah is 9 years old and is fighting a brain tumor for the 2nd time. She has lost her sight in one eye and will be going through treatment for years to come in hopes to keep her sight in the other eye. Proceeds will help with expenses as the family travels to Cincinnati for her care. 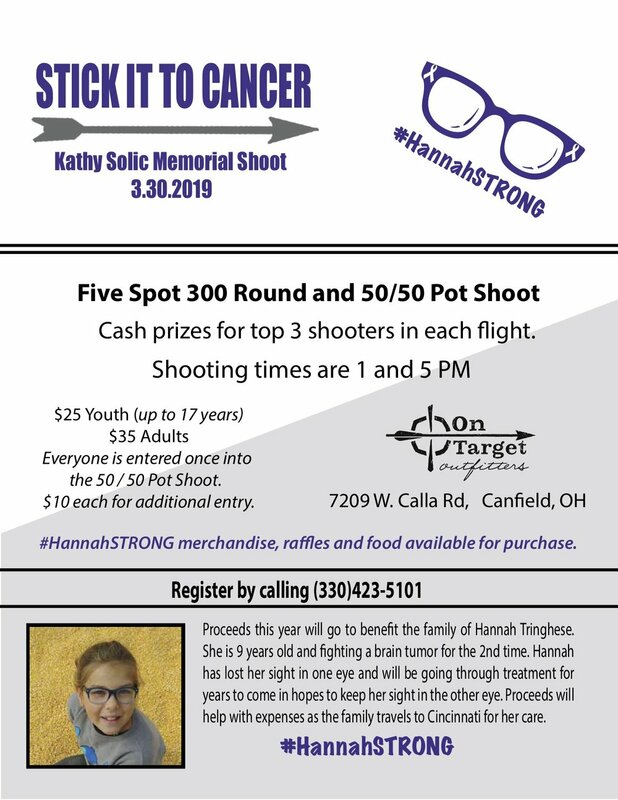 Join us on March 30th, 2019 for a five spot 300 round and 50/50 pot shoot. Shooting times are 1 and 5 PM. Don’t forget some extra spending money for food, raffle baskets and Hannah Strong merchandise. We are bringing generations together one arrow at a time again this winter in our Parent (or adult mentor) & Child Archery League. These two person teams will combine their scores using a handicap system to make the league fun, fair and competitive. Students ages 7 years and older are invited to participate. All levels of experience are welcome. You may use your own equipment or use ours. Because this league was so popular last year we are offing it on Monday and Thursday nights as well as Saturday morning - you only shoot one time a week. We ask you to pick one of the days, but if you have a conflict one week, you can always come one of the other days. The cost for this 10 week league is $90 per team. If a parent desires to shoot with more than one child, we can accommodate, but please call Steve to register the additional children. The first week will be informational and practice. Adult Archery League is back again! It is open to all shooters 16 years and over, all equipment welcome (no crossbows). This will be a 10-week league. The first shoot will be Sunday, January 6th at 8:00pm – You will need to attend this shoot to start the season. This is the day we will shoot for and draw for teams. We know that many students enjoy archery for the pleasure of the sport, time with their friends and for the fun challenges that they can have. The Archery Club will focus more on these elements and a little bit of competition. Coaches and experienced archers will be available to work with students to help them progress in their skills and to organize the games and challenges which will help them put these skills into practice. The archery club will meet on Monday nights (6-7:30 PM) in November & December (Nov 12 - Dec 17). The club is open to students ages 8-16. We highly recommend that students have their own archery equipment. We do understand that Christmas is getting closer and a bow might be under the tree for some students. If this is the case, students can use our equipment until they get their own. 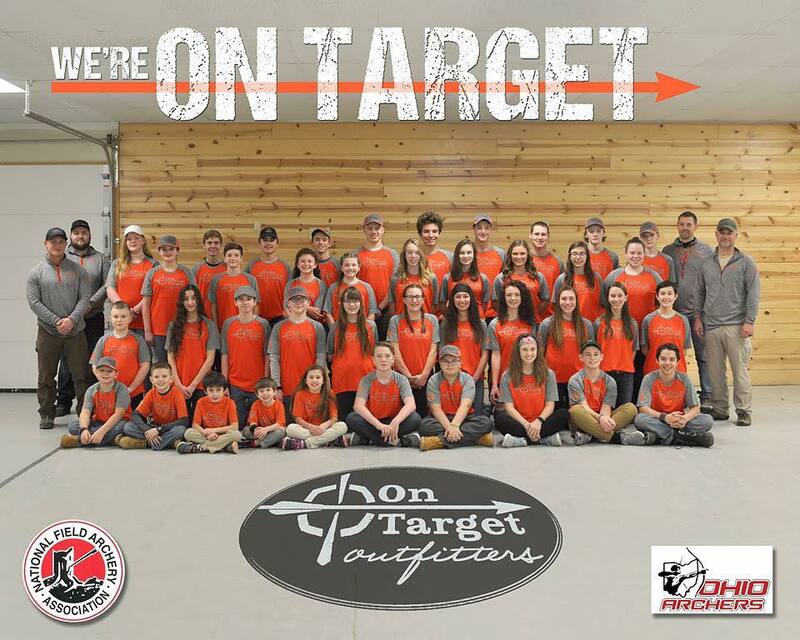 The On Target Archery Team is for students ages 10-17 who have their own archery equipment (not Genesis) who want to shoot competitively with their peers. We will host 4 tournaments at OTO and will travel to 3 or 4 others. Practices will be on Tuesday nights starting November 6 from 6 - 8 PM. Archery Team will end in mid April. The cost of archery team is $150. We will be offering a 5 week family rifle club beginning Saturday October 6. This event will conclude on Saturday November 3. The rifle club will give families a chance to learn all about shooting rifles in a safe environment while having a great time together and really developing their skills! There will be weekly challenges and prizes! We will provide the .22 ammo and rifles if needed. Space is limited to 10 families: 1 adult and 1 child per team. Please only register your child. You will be able to fill out all of your information on your child's form. Parent / Child Rifle Club will take place each Saturday in October and the first Saturday in November from Noon - 2 PM. The cost of Parent / Child Rifle Club is $80 per family. We will be hosting a Ohio Hunter Education Course at On Target Outfitters the weekend of October 6-7. This is a traditional 2 day course (12 hours) and will run on Saturday (8 AM - 4 PM) and on Sunday (noon-4 PM). All first-time hunting license buyers, except apprentice license buyers, must successfully complete a hunter education course before purchasing a hunting license. This is a free class and lunch will be provided on Saturday. Students who have completed this class are also eligible to be a part on On Target's mentored hunting program. We will be offering a 5 week instructional archery league this fall for students in grades 2-8. This program is for students with no or limited archery experience (including our Basic / Intermediate camps or after-school programs). 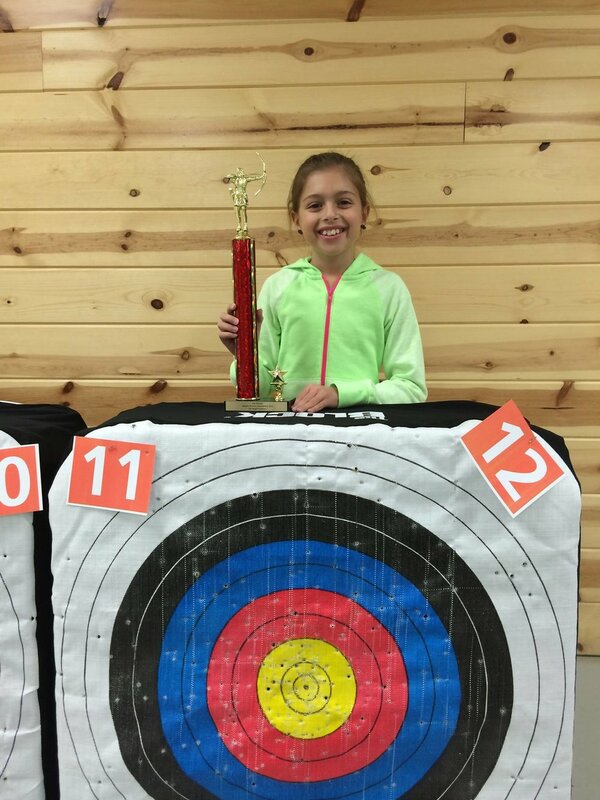 Using quality youth archery equipment, students will learn the fundamentals to be successful on the range while playing a variety of fun games. Each week will be a blend of instruction, games and a time to shoot for score (to measure personal growth). This program will conclude on Tuesday October 30 with a fun and friendly Genesis Tournament. Trophies will be awarded for 1st & 2nd place for all age brackets. The instructional League will take place on Tuesday nights. The range times are based on age. The cost of the Instructional League is $70. We will be offering 5 weeks of family fishing evenings beginning on Monday October 1st and will conclude on Monday October 28th. Each week will focus on a specific type of fish and will include some instruction and challenges, like biggest catfish, and the family who wins will get a prize! Families are welcome to come all 5 weeks or just a few weeks, whatever works best for your schedule. Family Fishing Club will be each Monday night in October from 5:30 to dark. These events are open to families who love to fish, who have never fished before, and everyone in-between! Families are encouraged to bring their own equipment if they have it. We will provide live bait, tackle, and fishing poles if needed. The cost of these events is $10 per family, per week. Please call to register for this program (330)423-5101. Join us on Sunday September 30 for a very fun day enjoying God's great outdoors! Activities will include archery, riflery, fishing, rock wall, bird house building and much much more. These open house activities are all free. Great food will be available for purchase. See you soon! 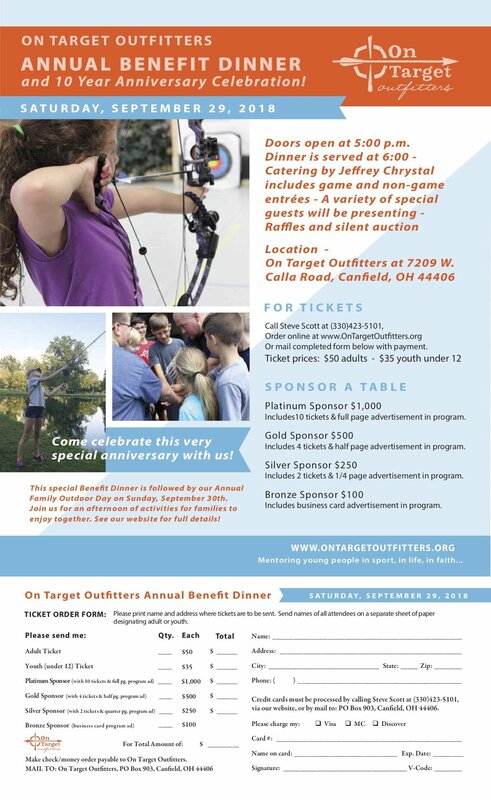 Join us on Saturday September 29 for our Annual Banquet and celebrate with us all the good things God is doing at On Target Outfitters. Also join us to celebrate our 10 year anniversary! It should be a great night with special guest speakers and dinner catered by Jeffrey Chrystal. There will be lots of great items to win! We are so thankful for your continued support and can't wait to celebrate with you! 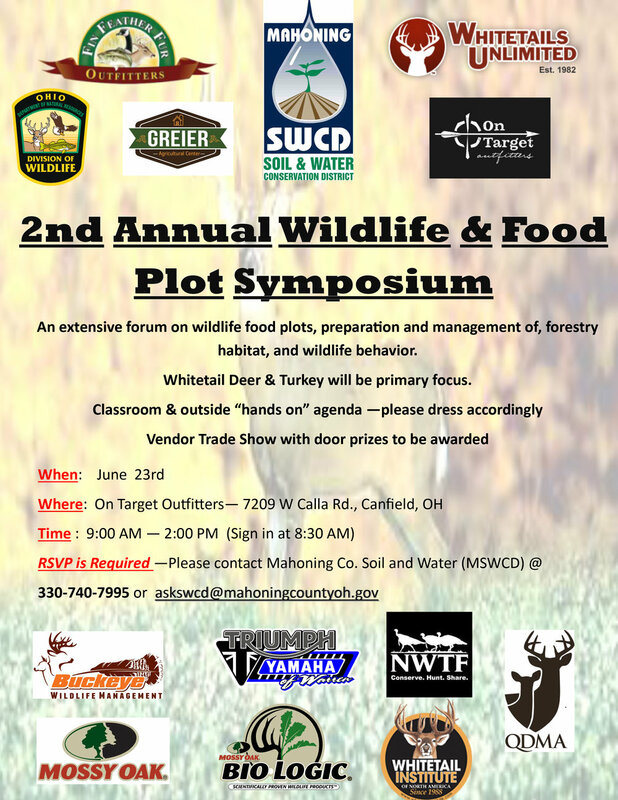 On Target Outfitters is privileged to be able to host a food plot and wildlife symposium led by Mahoning County Soil & Water on June 23. Learn how to test soil, prep the ground and use a variety of planting tools and implements. Special emphasis will be on whitetail deer and turkey. This in-depth and hands-on event is free but does require an RSVP. We hope you can join us. 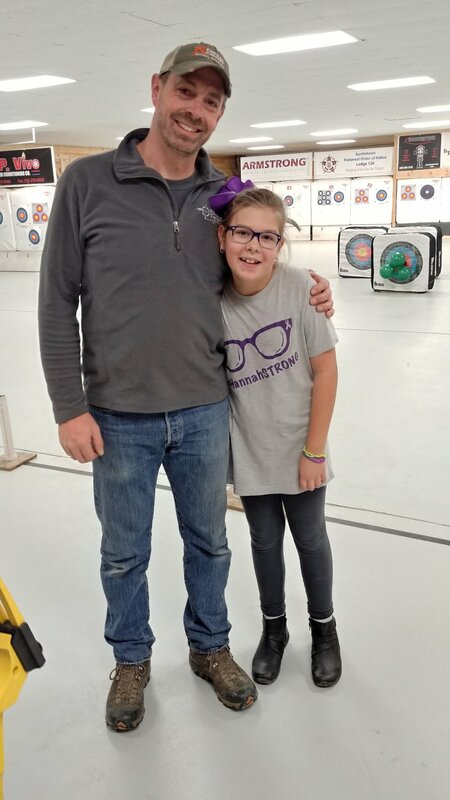 This 5 week special focus archery program allows children with Autism to participate in a sport that fosters confidence, social interaction, problem solving and team work. Our desire is that the skill sets learned in this sport can have positive results on the children and their families. While we want to see this program broaden for a greater range of students, for this particular program, participation will be limited to 8 students with high functioning autism and Asperger's Syndrome. For students ages 8-18 years. We will meet on Thursday nights starting April 12 from 6-7 PM. Adults have been asking us for several years when were we going to start offing an archery league for them. Well the time has come! I hope you can join us this winter for a fun, friendly, and competitive season. We will shoot Monday and Thursday nights, starting at 8:00 PM. (You choose which night). Come join us for a night of fun, fellowship and painting. We will be painting these cute caroling snowmen! Feel free to bring snacks and soft drinks. Adults and children 12 and up. This fun picture would make a great Christmas present! Don’t say you can’t paint! This is a guided class so everyone’s looks great in the end! RSVP and Payment due by Dec. 19th. Checks can be made pay-able to Wonderstruck. 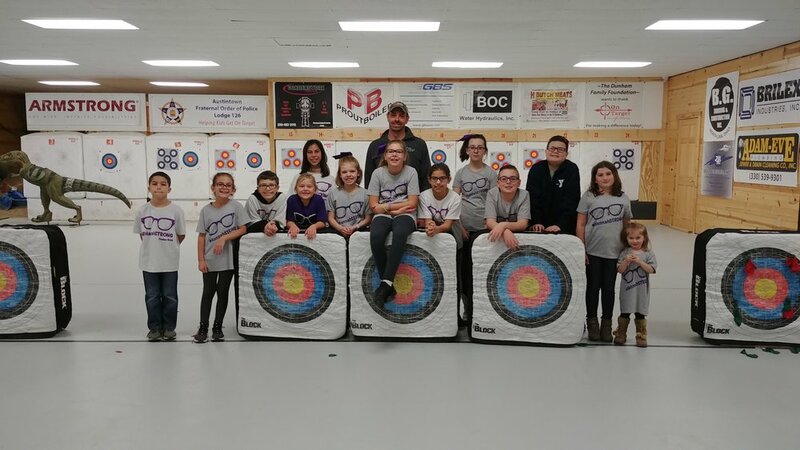 The On Target Archery Team is for students ages 10-18 who have their own archery equipment (not Genesis) who want to have fun shooting competitively with their peers. Coaches will help students progress in their skills and help them to achieve their personal goals. We will host 4 tournaments at OTO and will travel to 3 or 4 others. Practices will be on Tuesday nights starting November 14 at 6 PM and continue through April. I am excited to announce a new program we are offering at On Target Outfitters this winter --- an Archery Club. It is similar to our Archery Team where we provide coaching in proper form and technique, but it will be more like a league where students shoot for the pleasure of the sport, time with their friends and for the fun challenges that they can have. The Archery Club will focus more on these elements rather than on preparing for the next tournament. We will shoot for score on a regular basis (the league element) but will also play a variety of games and challenges. The archery club will meet on Monday nights (6-7:30 PM) starting November 13 through December and on then on Saturdays (2-3:30 PM) in January, February and March. We will be offering a 5 week instructional archery league this fall for students in grades 2-8. This program is for students with no or limited archery experience (including our Basic or Intermediate archery camp program). Using quality youth equipment, students will learn the fundamentals to be successful on the range while playing a variety of fun games. Each week will be a blend of instruction, challenges, and a time to shoot for score (to measure personal growth). This program will conclude on Saturday November 4 with a fun and friendly Genesis Tournament. Trophies will be awarded for 1st & 2nd place for all age brackets. The instructional League will take place on Monday nights. The range times are based on grades. Hey Homeschoolers! Join us outdoors this fall for a fun time exploring God's great creation and developing your skills as an outdoorsman / outdoorswoman. Activities will include scavenger hunts, fire building, emergency shelter construction, nature education and, of course, fishing, archery and maybe even riflery. Class will meet from 1:00 - 3:00 PM every Monday in October rain or shine (hopefully no snow). This is for students in grades 1-12 (certain activities may be split into age groups so as to challenge the older students). Parents are encouraged to participate as much as they would like. The cost of this program is $65 per participant. Our Hunting Club is for students who want to experience the sport and tradition of hunting but don't have anyone to take them. Our experienced adult hunters enjoy mentoring students about safety and ethics, hunting strategy, game care and even wild game cooking. We have a number of great hunting opportunities for students who want to get out in the field with us this year. If you want to hunt for squirrel, rabbit, pheasant, turkey or deer, consider, joining our Hunting Club and being a part of the fun! The Ohio Hunter Education Course which we will be offering on September 30 is a prerequisite for this club. Our first event is a squirrel hunt in early October. Join us on Saturday September 30 from 9 AM - 1 PM for the Ohio Hunter Education Course. This class will be a two-part class. The first part is the Online Portion (done on your own prior to class) and the second part is the classroom time and test on September 30. Please read below for more details and for registration. The Home Study Course is for Ohio residents younger than 18 years of age (but parents are always invited and encouraged to accompany their child). The online portion of the course will take approximately four hours to complete, but you may stop and pick up where you left off in the course as you please. There are quizzes at the end of each unit. You must pass the unit quiz to proceed to the next unit. Once you complete all units, you will need to pass a final exam to receive a voucher to attend the final, in-person classroom portion. The cost is $15 payable once you pass the final exam and prior to printing the voucher. We will be offering the "In-Person Classroom Portion" of the class on Saturday September 30 from 9 AM - 1 PM. Students must have completed the online portion prior to this class and must bring their voucher with them. Please call 1(800)WILDLIFE if you have any questions about the online portion of the class or you can call Steve Scott (330)423-5101 if you have any question about the classroom portion. Join us on Saturday, September 23 for our annual Adult / Student Team Fishing Derby. The pond will be stocked with additional fish for lots of fun fishing action. Prizes will be awarded for the first fish caught, the most fish caught, as well as many other fun prizes too. The grand prize, a Lake Erie fishing trip for two with Wreck-N-Eyes Charters, will be awarded for the biggest fish caught. Cost is $20 per two person team (1 adult & 1 student under age 18). Registration will start at 8 AM. Fishing Derby will take place from 9-11 AM rain or shine. Join us on Saturday September 23 for a very fun day enjoying God's great outdoors! Activities will include archery, riflery, fishing, rock wall, chainsaw carving and much much more. These open house activities are all free. Great food will be available for purchase. Join us on Friday September 22 for our Annual Banquet and celebrate with us all the good things God is doing at On Target Outfitters. It should be a great night with guest speaker, YSU President, Jim Tressel and dinner catered by Jeffrey Chrystal. There will be lots of great items to win. Join us on Saturday July 22 for a fun family fishing derby from 9:30 - 11:00 AM. This is a free event with prizes being awarded for the first fish, the biggest fish and the most fish. This derby. This is a family event so kids must be accompanied by adults and adults must be accompanied by a child - but all participants can fish. Mark your calendars for July 22 (originally scheduled for July 1) from 8 AM - 9:30 AM when we will be hosting a Passport to Fishing program which is a free beginner angler program. This program is led by trained volunteer instructors who provide skills, techniques, and information that allow any novice angler to start fishing. The program consists of educational stations focusing on hands-on participation. This program is for beginner anglers ages 4-10 years old. From 9:30 - 11:00 AM on that same day we will be having a free fishing derby with prizes being awarded for the first first, the biggest fish and the most fish. On Target Outfitters is privileged to be able to host a food plot and wildlife symposium led by Mahoning County Soil & Water on June 3. Learn how to test soil, prep the ground and use a variety of planting tools and implements. This in-depth and hands-on event is free but does require an RSVP. We hope you can join us. Just in time for the spring turkey season, we will be offering a Hunter Eduction "Home Study" Course on Saturday, April 8 from 9 AM - 1 PM. Prior to coming to class students will need to read the Hunter Education Manual and answer the questions at the end of each chapter. There is no cost for this class. To register call 1(800)WILDLIFE or register online.